Patriot Family Connection offers resources and information for military families as well as contests to win exciting prizes. 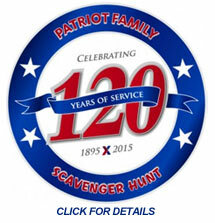 Patriot Family contests run throughout the year and are designed especially for the unique Military patron. Information from the latest Patriot Family Connection contests, and winners from past contests, can be found in our Contests section. The Exchange would like to thank Military members and their families for what they do to support this great country. Patriot Family Connection is our way of recognizing and rewarding their unselfish contributions that benefit all Americans! Welcome! Here you will find recent news stories, videos, photos, contests, coupons and podcasts. Join in the conversation! We are excited to take an active role in the military community and hope to hear real-life storeies from Patriot Families! The Exchange, your Army & Air Force Exchange Service. Our goal is to create a voice that truly represents who we are - a company of individuals who are military, former military, military spouses, and friends and family of military loved ones - all celebrating the Patriot Family Connection. Interviews with movie stars, uploads from viewers, information about the Exchange and more! Here are a few of the latest uploads. Click on Watch Videos to see all categories of available videos from the Exchange.